CO2 levels are listed at 370 ppm in the activity write-up that can be downloaded. This needs to be updated since current levels are over 400 and rising. Students use a simple spreadsheet climate model to explore how solar luminosity, albedo, and an atmospheric greenhouse gas loading parameter affect the global mean surface temperature in different climate regimes (Modern, Archean, Neoproterozoic). This activity has students explore model scenarios; real and recent data can be added to the activity by the instructor. The two science articles from Scientific American are excellent. GEEBITT is a 1-dimensional energy balance model that calculates global mean surface temperature, based on a planet's distance from the sun, solar luminosity, global albedo, and a parameterized 'greenhouse-factor' (called 'GHF' in the activity). Comments from expert scientist: Great exposure to a relevant model. 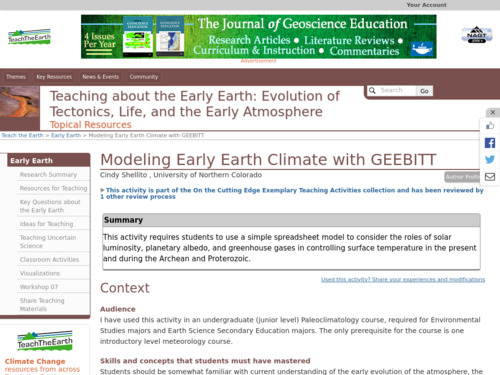 Also allows students to play with the model and investigate several interesting climate questions. Students work in teams of 2 or 3 to conduct a series of computer experiments with the simple spreadsheet model, collect and evaluate data, and then share their results in a class discussion. If class time is short, the class may be divided into three groups, with each group focusing on a different time period (Modern, Archean, Neoproterozoic). At the end of the class, each group can share their results and insights with the class as a whole. This resource may be difficult to do without a familiarity with a number of topics (clarified in the instructions). The readings will help students better understand the the parts of Earth's history that are featured in the activity. Students should be comfortable with using spreadsheets (such as Excel) and spreadsheet models. It would be helpful for teachers to review some of the formulas in the spreadsheet. Activity handout and instructors notes are provided but the instructions are not as detailed as many educators and students might need.